If you've ever tried to find a parking spot at The Camp in Costa Mesa, you might understand what I mean by calling the place total chaos. Normally pleasant men and women turn into rabid beasts intent on squeezing by or through you to get to a parking spot their hawkeyes spot. The lot is cramped and always busy because of the yoga studio and the great restaurants there. 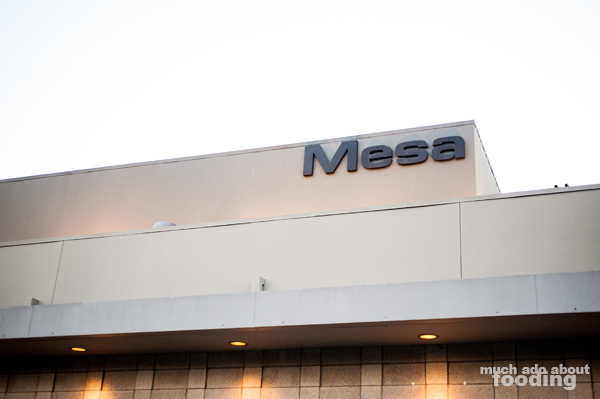 One such popular restaurant would be Mesa, the large square behemoth in the corner of the lot that features its own valet service (much needed!). It's the hip place to be, it seems, and often I hear about friends dropping by for some late night small plate sharing. We were invited to come in and try out their "secret" menu; all for surprises, we decided why not? We were curious as to what Chef de Cuisine Ernesto Alvarado had in store for us. One neat characteristic of the Mesa building is the enormous skylight (covered or uncovered available) in the middle of it. 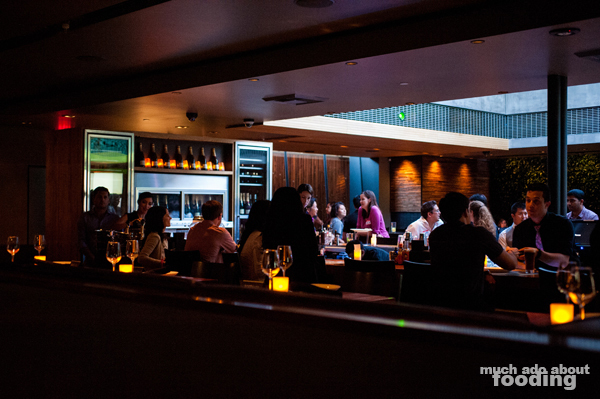 It provides just enough sunlight to see what you're eating and at whom you're looking but the position of it allows for more intimate low lighting for the bordering tables. We found ourselves sitting in a booth with a silent TV and ample space. Our lovely waitress explained a little bit about Mesa before tracking down the secret menu for us - an unassuming Moleskine notebook with neat, hand-drawn sketches on several pages as well as the secret menu near the middle. 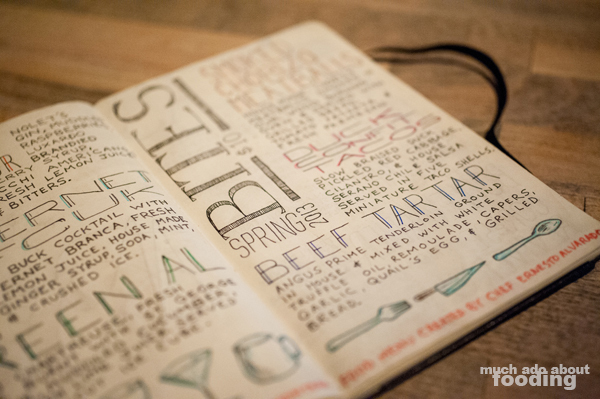 Clean handwriting and images adorned the designated pages and showed some tempting menu items. 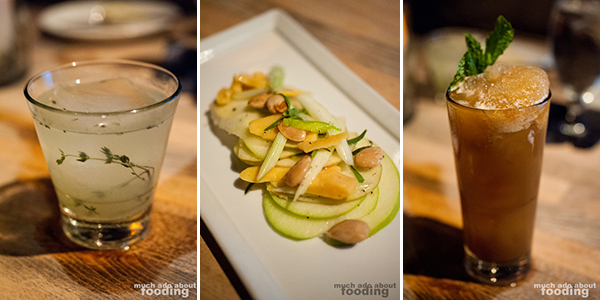 While looking it over, we had plates of one of their most popular regular-menu dishes, the Heirloom Apple Salad ($9 - Pink Lady Apples,5 year aged Gouda, Marcona Almonds, Tarragon and Cider Vinaigrette); it was crisp and refreshing with the tartness of both the apples and vinaigrette shining through. The Gouda was definitely strong in flavor so try it if you're a fan of that cheese. Two cocktails from the secret menu also came out - the Green Al ($14 - green Chartreuse, fresh thyme burnt with St. George Absinthe, muddled cucumber, mint, and fresh lime juice served on a hand-cut ice cub) and the Bernet Fcuk ($14 - A buck cocktail with Fernet Branca, fresh lemon juice, housemade ginger syrup, soda, mint, & crushed ice). Between the two, we both highly favored the former. There was another drink called the Seuss Doctor and a whole other spread of classic cocktails such as the Aviation and Martini. 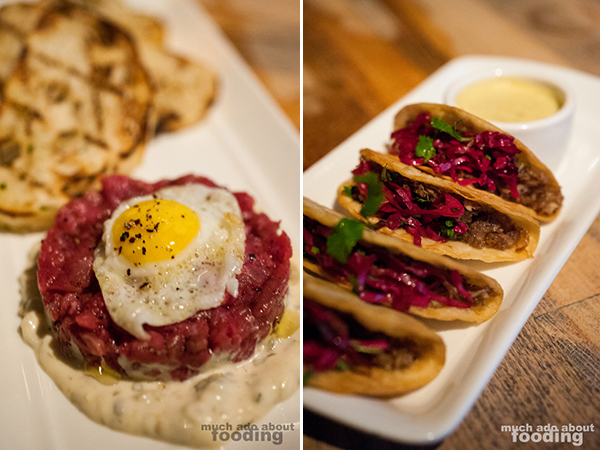 Next were items from their hand-drawn secret/off menu at $10 each: Beef Tartare (Angus Prime tenderloin ground in-house and mixed with white truffle oil, remoulade, capers, garlic, quail's egg, and grilled bread), Duck Confit Tacos (slow-braised duck, pickled red cabbage, cilantro, and house Serrano chile salsa), and Smoked Chorizo Meatballs (housemade chorizo meatballs smoked in wood-burning oven, served with grilled bread, tomato passata, and fresh Parmesan). The tartar was my favorite of group with its fresh beef and pungent truffle - the quail egg gave a nice, fried touch to the whole ordeal which managed to stay fresh in your mouth from the capers. The confit tacos came off a tad dry but were somewhat saved by the pickled cabbage and the crunchy taco shells. 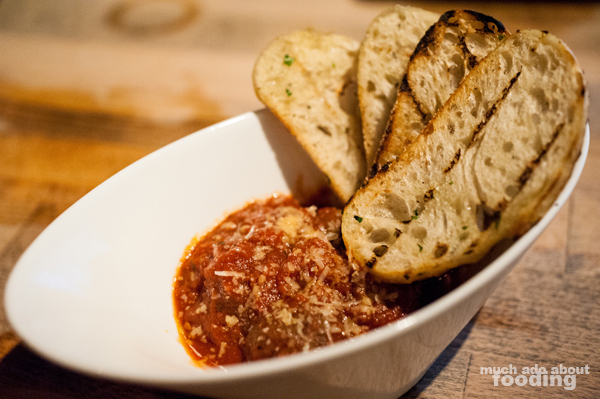 I loved the bread that came with everything, and it was absolutely necessary for the meatballs as there was a whole lot of chorizo (naturally salty)! The tomato added a bit too much salt to the overall dish but the meat was tender as needed and the bread great. We also had their Cast Iron Skillet Mussels ($14 - PEI mussels, sea salt, cracked pepper, gently melted butter, lemon, and EVOO) which were simple but a delight because of that. 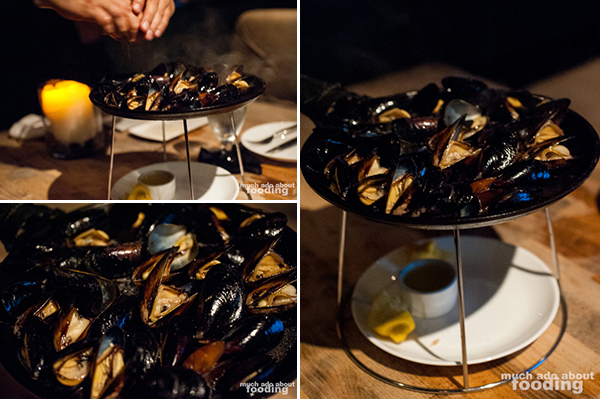 The mussels' natural tastes were allowed to speak for themselves, and the presentation helped too as our waiter came out with the steaming skillet and squeezed fresh lemon juice all over them. 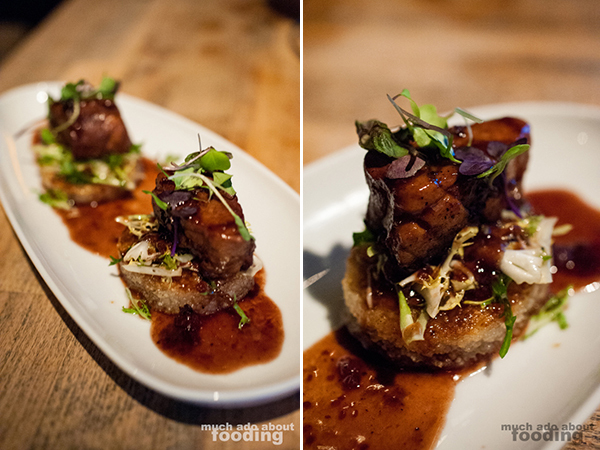 Another appetizer we had was their regular-menu Pork Belly ($12 - pan seared on top of crispy rice cake and frisee in a pork raspberry reduction and microgreens), cuts that weren't as tender as other pork belly dishes we've had before. Unfortunately the rice cake was not crispy but we see this with every dish we've had before that includes rice cake; it's hard to keep it crispy for long. 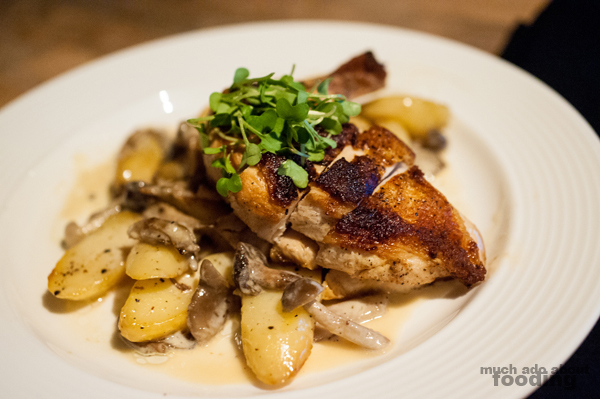 Then for our main courses, we had their revamped recipes of All Natural Pork Chop (served with brussel sprouts, hickory smoked bacon and housemade apple marmalade) and Free Range Chicken (served with wild assorted mushrooms, fingerling potatoes, creme fraiche, and truffle oil). 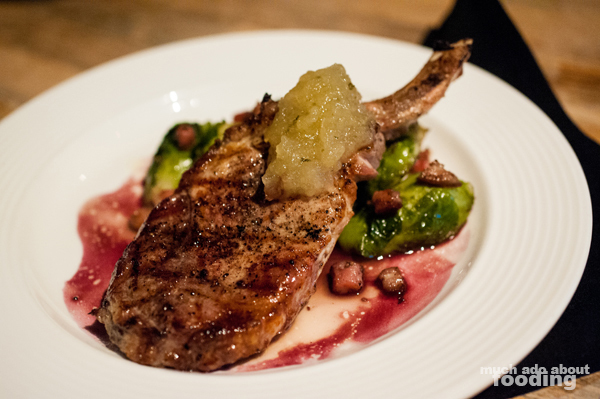 We found the pork chop to be rich and juicy, offset from being too heavy by the inclusion of a lightly sweet apple marmalade. It was one of the best parts of the night! The chicken, on the other hand, came out quite dry and overwhelming truffle-d (I could smell it before I saw it). The potatoes and mushrooms were cooked nicely and had a good texture to them but it was difficult to finish off the dish when there was too much truffle going on. Somehow we made room for dessert which is still in the experimental stage (you won't see this all on the menu just yet). 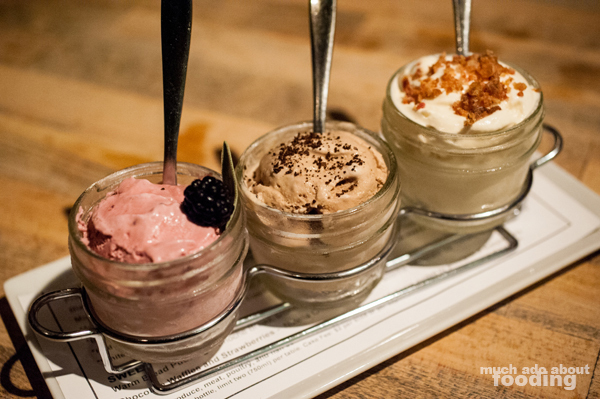 We were served with a housemade Ice Cream Trio of Organic Raspberry Sage, Vanilla Maple Bacon, and Espresso Chipotle Stout. The raspberry was smooth and creamy, leaving the aftertaste of sage in your mouth. For the maple bacon, the base seemed to be maple so it came off quite sweet for the sweet lovers. 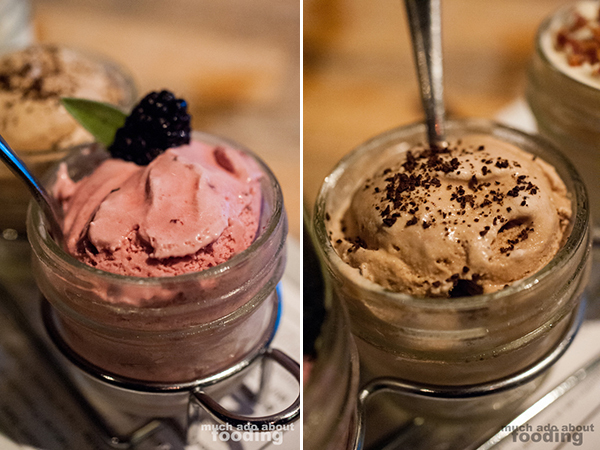 Our favorite was the stout ice cream for its bold flavor and espresso grounds' texture. They also brought out their newest dessert experiment, the Terrine Trio (housemade pineapple, pistachio, and pomegranate ice creams). I compared its presentation to a wacky Neopolitan which is familiar to most people due to childhood but possessed more mature flavors as shown. 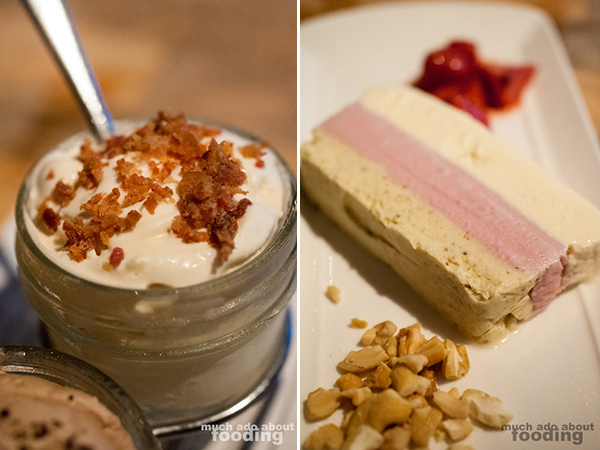 Each was great in its own way, especially the tart pineapple ice cream that got gobbled up first. If you're interested in going to Mesa, keep in mind that you should be ready to spend a while in the lot looking for parking! Don't be afraid to ask for their secret menu either nor should you refrain from writing in the pages of the book. Make sure to look for our own mark made in there. Our thanks go out to everyone involved in making this dinner happen for us!